Whether solo or with his band Drivin’ n’ Cryin’ (DNC) Kevn Kinney has written a wealth of great music. His songs come from the voice of the common man with lyrics that most can relate to. He sings about life and the trials and tribulations we all face on our journeys. While he may not be a common household name Kinney is revered by peers and fans with many taking his songs to heart. 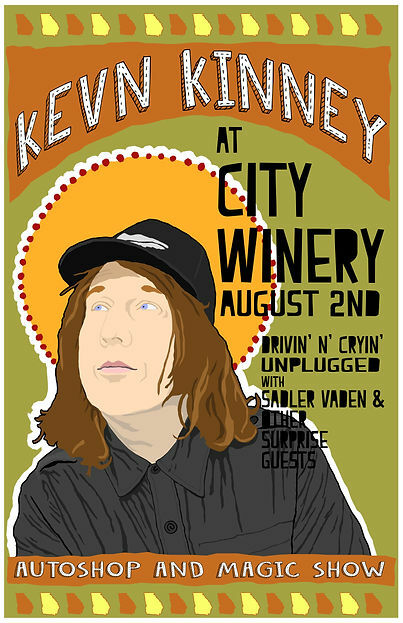 This week Kevn Kinney begins a month long residency at Atlanta’s newest music venue the City Winery – the Autoshop and Magic Show - where he will bring along a myriad of friends to play songs from his vast catalog of music. Tuesday August 2nd, Kevn will be joined by DNC (Kevn, Tim Nielsen and Dave V. Johnson) for an acoustic set of songs from their biggest hits to the most obscure deep track. Sitting in with the band will be former DNC guitarist Sadler Vaden (now with Jason Isbell’s 400 Unit). When DNC gears it down from their normal ear blistering rock sounds you never know what you are going to get. Kevn, Tim and crew like to rearrange, reinvent and break down their music to keep the crowd guessing. It is always nice to see DNC mix things up every now and then. In addition to playing with DNC there is a good chance Sadler Vaden will get to show off a few of his solo songs. From what he has released in the past expect some mighty fine catchy tunes. Be on the lookout for any of the special guests Kevn will bring along. You never know who may show up to sit in and play and they are not letting us know either. Kevn says you have to show up to find out. This show is a reason to get out of the house on a Tuesday night. Throw caution to the wind and go enjoy some great music from Kevn Kinney and friends. It will be well worth the loss of sleep.